Perfect for a couple on a honeymoon or just looking for a great vacation, the 1-bedroom condo at the West Bay Club offers the most in relaxation, views, and amenities. Everything you need is here, from the comfortable bedroom to the full kitchen and spacious living room, and right out to the breezy balcony with a view. Grace Bay Beach is just a few steps away where you can swim and snorkel in the clearest waters on the planet, and the West Bay Club also offers a nice-sized pool as well. At this cozy rental, you’ll get resort amenities, all the comforts of home, and lots of peace and quiet. West Bay Club is one of Turks & Caicos’ finest hotels. Located in Providenciales on the shores of Grace Bay, it offers a peaceful retreat with an architectural style that blends Caribbean charm with modern chic. 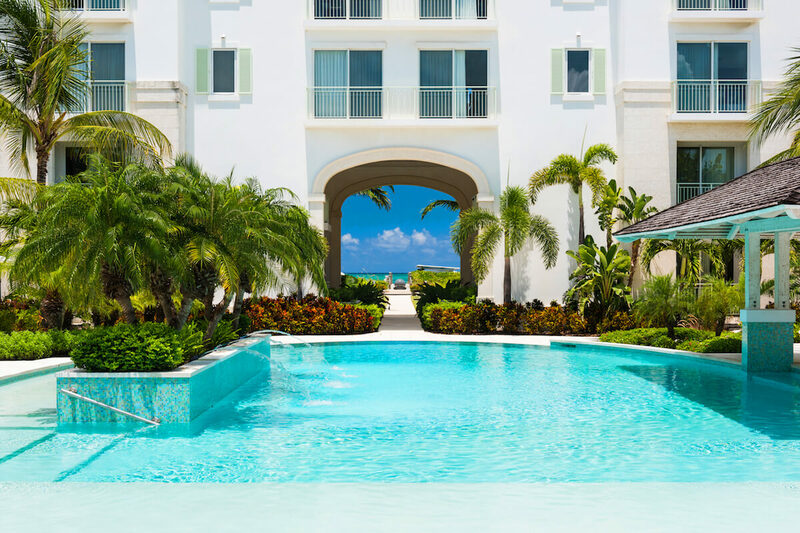 West Bay Club features nicely appointed ocean front suites and a boutique range of amenities, all placed directly on the white sands of Turks and Caicos’ most famous attraction - Grace Bay Beach. Spacious studios with courtyard view, king-size bed, sitting area, kitchenette, and private bathroom. Features include: air-conditioning, ceiling fans, marble bathrooms and floors, complimentary wireless internet, television with cable, iHome clock radio, safe, under-the-counter fridge, and food preparation area. Occupancy: 2 guests. 1,099 sq. ft. Uniquely designed suite has living/dining room with ocean front terrace and outdoor furnishings, and a second balcony with a pool view. Large master bedroom with pool view, balcony, king-size bed, and bathroom. Features include: air-conditioning, ceiling fans, bathrobes, marble bathrooms and floors, complimentary wireless internet, 46-inch flat panel TV with cable, DVD/CD surround-sound home theatre system, iHome clock radio, and safe. Galley kitchen includes state-of-the-art stainless steel appliances, granite counter tops and washer/dryer. Occupancy: 2 guests. 1,491 sq. ft. Large living/dining room with spacious ocean front terrace and outdoor furnishings, full kitchen, and powder room. Large bedroom with ocean view, king-size bed, and en-suite bath. Features include: air-conditioning, ceiling fans, bathrobes, marble bathrooms and floors, floor to ceiling windows, complimentary wireless internet, 46-inch flat panel TV with cable, DVD/CD surround-sound home theatre system, iHome clock radio, safe, kitchen including state-of-the-art stainless steel appliances, granite counter tops, wine cooler, and washer/dryer. En-suite has separate tub and shower with double sinks. Occupancy: 2 guests. West Bay Club is a great vacation spot to avoid the overcrowded hotels. The beach access was really amazing, and the service team was really good. Overall, this is a great vacation spot. We will be returning. The West Bay Club and Provo in T&C are beautiful! The West Bay Club is a gorgeous boutique property. This was our 2nd stay at this property and not only are the condos nice, but the view of Grace Bay is always breath taking. Most of all, we like the small boutique feel of WBC and the staff is very friendly and always helpful. We continue returning to T&C for its beauty, the ability to really relax and their friendly people. Andrew was great to work with and made our booking seamless.